Hi all as you may have gathered we have had a problem with our Vodafone dongle. It has done well as it was falling to bits with so much use. We are now waiting to get a new one sent through. To get this page on, we have found a WiFi hotspot. We have got loads to catch up on, but you will all have to be patient with us. When we tried the taps this morning the pump was groaning and the tap spitting at us letting us know we were very low on water. The gauge was showing two and must have stuck so this made our mind up to move today. We first set off up to the water point at Shiplake lock, it was nice to be cruising again. As we were filling with water two other boats turned up to do the same. Derwent6 has a 500 litre tank and takes a while to fill. Al had a solution of offering them our old magazines to read while they waited, and it worked. We had planned to have a pumpout here as well but it wasn't working. We then made our way back to Reading, and through Sonning Lock, to fill up with diesel as we were getting very low on that as well. We pulled up on the pontoon at the marina, and yep you guessed it, they had run out of diesel over the weekend. They were due a delivery at 3.00pm, so we made our way over to Tesco's to pass the time, and top up the cupboards. Better boating is one of the cheapest marina's for diesel on the Thames, so it was worth waiting for. We also had our pumpout there as well. It was now getting late so we made our way back to Sonning and were lucky enough to get on our mooring when we got there. With our tanks all sorted we relaxed in the evening watching the birds writing MUM in the sky, wonder what that means. The weather was lovely, but intermittent heavy showers were on the way. It stopped us getting out but we didn't mind as we wanted to watch England in the rugby anyway. In the afternoon we got out the keyboard and guitar and had a bit of a jamming session. We enjoyed it so much we ended using most of the day up doing it. It's a good job were in the middle of nowhere. There was a slight nip in the air this morning but it was a beautiful day. So we made it our washing day.. It was piling up, and we were out of underpants (not a good move), so we put out the washing line and managed to get it all dry. It soon got hot and humid and it made us feel like doing nothing, but Del still went out on his bike again for a couple of hours. Al chilled out with a book on the bow of Derwent6. Why would you want to move! It was a nice day today with a mist over the water. The wind had dropped and the waters here were calming down again, so it was cratch covers up and legs stretched out with a cup of tea. Nice.. Then it was on to those little jobs you keep meaning to do but never get round to...lol. We were being knocked about last night with 50mph winds belting up the Thames. We are tied here on two trees and it seems to be the best way because the ropes slide up and down the tree as the water levels change. If we were on pins it would have pulled them out by now as the levels on the river can change very quickly. The wind has been bashing us against the bank as fenders don't do anything here. We spent the best part of the morning watching the wind and being rocked about like a tin can. We did manage to go for a short walk to get some fresh air but never ventured too far. We did have a problem with the runners on the sliding cupboard and it turned out to be a runner which had broken. Del managed to make a temporary repair and we will have to get a source from Fernwood our boat builder. We then had a bit of a clean up and the porthole liners were cleaned again. We also sorted out the paperwork. It's been funny really because we haven't felt like moving since we've been back. It is just nice to be home and living on the Thames for the moment, after all we have got a gold licence so we might as well use it. We like the fact that we can moor between two trees and be left alone for a couple of weeks if we wish. Due to our circumstances and commitments at the moment, we will be hanging around here for a bit longer. We got up late again today and had breakfast out in the cratch. We had a lovely Sunday roast with the Grand Prix. Del then went out for a bike ride around Shiplake and Wargrave. We were up early to watch England in the Rugby. This was followed by watching the Grand Prix qualifying and then it was a film in the afternoon followed by Strictly Come Dancing and the X Factor. We had to run the engine twice today due to battery usage...and yes, we are getting couch potato's! We were up early this morning because we were expecting David Walliams to be coming past us today and we didn't know what time it would be. He was at Reading and was getting in the water around 7.00am. 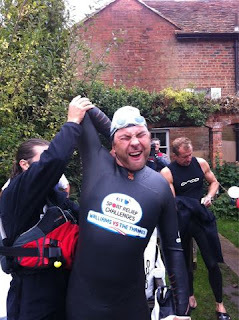 This is just an amazing feat as he is swimming the length of the Thames for Sports relief. We then found out he was stopping at Sonning for breakfast, well a piece of toast and a cup of tea at the little cafe at Sonning Lock. When he arrived he did look at bit worse for wear, but was still in very good spirits making jokes with everyone. It was great to see one of the nearby schools had all turned out for him all in their blue school uniforms. He then got back in the water and swam past Derwent6 with the sounds of Queen's "We will Rock You" and "We are the Champions" blasting out and echoing down the Thames. The banks were filled with supporters following him and his trainer, along the way. He has already raised nearly half a million. It was so inspirational, it made you feel good to be British... well done mate!!!! It all felt a bit of an anti climax after he had gone through and we ended up doing nothing really for the rest of the day. We had a nice lay in this morning and it was bliss... When we did surface Del decided to go out on his bike and ended up doing a 20 mile round trip. Al spent some time reading and catching up on some other things she had neglected over the last few months. We got together in the afternoon for a snack lunch. We had got a call from friends Maxine and Graham who wanted to come up and see us, it was also Maxine's Birthday. They arrived at about five o clock and we chilled in the cratch of Derwent6 till our stomach's started to rumble. We then all walked into Sonning village and went to The Bull Inn and had a lovely candle lit birthday meal and we never left till midnight. We said our goodbyes and then walked back to Derwent6 in the dark (your eyes soon get used to it! ), falling into bed at 1.00am. We really wanted to move today but there was no way, with the wind howling across the marina and the rain lashing the starboard side of Derwent6. So it was a time to relax in our own home. We chilled for most of the day only braving the weather to go to the toilet to save our waste tank. Lets hope we can move tomorrow!!!! We decided to take a break from the blog as we have gone through a lot over the last few weeks... but we are back with a vengeance.. It is time to move on, with Len overlooking our adventures, and we plan not to let him down. We got back to Derwent6 today after making sure Terry (Del's step mum) is alright to move on herself. We have been helping put their house on the market and getting it ship shape for sale. It has been hard clearing out things, but we got it all done. We have also been to three birthdays while we helped out. It was Jack's 11th birthday and he got a drum kit....... Del had a go and broke his seat! Oops let hope we can get it fixed Here you can see Jack playing his drums (without his seat and Samuel helping with one hand after breaking his arm falling off his scooter). We also went to Alex's 12th birthday where we were treated to a nice meal by Richard and Lisa. Then it was Zak's 18th birthday where we went to an American Diner and took over the place. 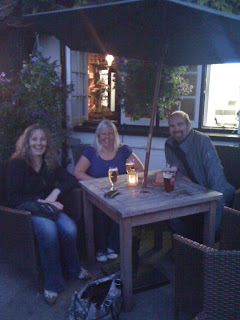 We had great fun and thanks Steve for paying for the meal. When we arrived back, Derwent6 was covered in cobwebs, but was in very safe hands. After a good clean up and a wipe down things are getting back to normal and it is great to be back home. (the brasses look like hard work though!). The plan was to move off today but with the winds getting stronger and rain looking threatening, we thought we had just better stay put. Derwent6 has been in the Thames and Kennet marina for over seven weeks and it has put a dent in our budget, but we will get through it. The weather looks worse tomorrow so we will just sit it out.